Mixtures of magical herbs, roots and flowers, believed to attract certain conditions to the owner. Carry a herbal charm in your purse, wallet or pocket. Place in drawers, under your pillow or include in a gift card. 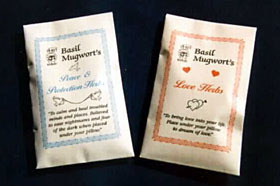 Basil Mugwort's Herbal Charms are made in Australia and come in a small recycled paper sachet. To bring love into your life. Place under your pillow to dream of love. To attract money, customers and material gains towards you. Angelic herbs to attract and commune with your ever present guardian angel. To bring success to the possessor, at work, at study, finance, or any venture needing a successful outcome. Calm and heal troubled minds and places. Place a sachet in each room and upon your person. Believed to ease nightmares when placed under your pillow. Carry with you when travelling and tuck one in your suit case orunder your pillow.